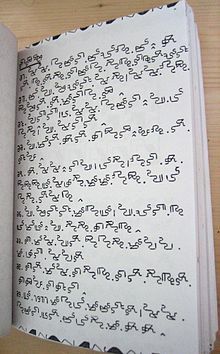 Mandombe or Mandombé is a script proposed in 1978 in Mbanza-Ngungu in the Bas-Congo province of the Democratic Republic of the Congo by Wabeladio Payi, who related that it was revealed to him in a dream by Simon Kimbangu, the prophet of the Kimbanguist Church. Mandombe is based on the sacred shapes and , and intended for writing African languages such as the four national languages of the Congo, Kikongo, Lingala, Tshiluba and Swahili, though it does not have enough vowels to write Lingala fully. It is taught in Kimbanguist church schools in Angola, the Republic of the Congo, and the Democratic Republic of the Congo. It is also promoted by the Kimbanguist Centre de l’Écriture Négro-Africaine (CENA). The Mandombe Academy at CENA is currently working on transcribing other African languages in the script. It has been classified as the third most viable indigenous script of recent indigenous west African scripts, behind only the Vai syllabary and the N'Ko alphabet. A preliminary proposal has been made to include this script in the combined character encoding ISO 10646/Unicode. A revised Unicode proposal was written in February 2016 by Andrij Rovenchak, Helma Pasch, Charles Riley, and Nandefo Robert Wazi.
. It has no diacritic. (n) disconnected from the vowel. This always joins the consonant body, else certain signs could be read in more than one way. is placed between the two separable parts of the vowel glyph, it represents an intervening /r/. ). The exclamation mark is like a lambda, λ, and the question mark is like a turned Y, ⅄. ^ Pasch, Helma. 2008. Competing scripts: the introduction of the Roman alphabet in Africa. International Journal of the Sociology of Language 191:65-109. ^ Rovenchak, Andrij; Pasch, Helma; Riley, Charles; Wazi, Nandefo Robert (20 July 2015). "Preliminary proposal for encoding the Mandombe script in the SMP of the UCS Revised)" (PDF). Unicode. Retrieved 30 July 2015.